Ficha de Catálogo de la Catedral. Plan Especial de Protección del Sector 7 "Catedral", aprobado provisionalmente el 31 de octubre de 2012. With sixty pillars supporting its 68 ribbed vaults, the Cathedral boasts more than thirty chapels and additional spaces such as the Ornaments Room, Antechapter, Chapter House Main Sacristy, Sacristy of the Chalices, Choir, as well as numerous altars. 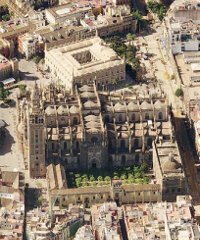 While the architect of the Cathedral is unknown and little is known about the various masters who took part in its construction, it has been postulated that the original design could have been carried out by the master builder of the Cathedral at the end of the 14th century, Alonso Martínez, or by Isambret and Carlin, who worked on the project beginning in 1434. However, other names have also been proposed such as Juan Norman, Juan de Hoces, Simón de Colonia, Alonso Rodríguez or Gil de Hontañón, who completed the construction of the Gothic part of the Cathedral. During the 16th century, the religious power of Seville’s Council (Cabildo) and its humanist ideas were highlighted by the Renaissance style of additions to the Cathedral designed by prestigious architects such as Diego de Riaño, Martín de Gaínza, Hernán Ruiz II and Asensio de Maeda. During the centuries that followed, further additions were made to the Cathedral, including the Office Pavilion, completed in 1929. Standing next to the Cathedral and its five naves is the crowning achievement of Almohad architecture, the Giralda minaret. With Roman ashlars for its foundations, Islamic bricks for the tower and a Christian belfry crowing the structure, the Giralda is the perfect symbol of the history, culture and spirit of Seville. 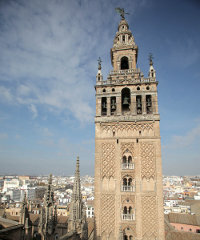 The Giralda was designed in 1184 by Ahmad ibn Baso who was responsible for bringing the Roman ashlars for the foundation and which can still be seen at the base of the tower today. His successor, Alí de Gomara, used bricks and decorated the walls with the diamond-shaped high-reliefs known as sebka, while adding pairs of windows with alternating lobed and horseshoe arches. 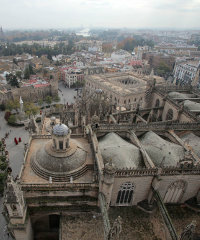 Between 1558 and 1568, the Cordoba native Hernán Ruiz II built the Christian belfry atop the minaret and which he perfectly integrated into the original Moorish design. At an altitude of 96 meters can be found the Renaissance-style bronze statue and weather vane, the Giraldillo. The Seville Cathedral houses an overwhelming collection of art, including sculptures by Mercadante, Fancelli and Montañés and paintings by Campaña, Zurbarán and Goya. In addition, the Cathedral boasts a Choir with extraordinary wood carvings, a Baroque organ, beautiful stained glass windows, diverse ceramic art, and a vast collection of choral books and other sacred ornaments. The Cathedral of Saint Mary of the See is protected as a Area of Historical-Cultural Interest (Zona de Interés Histórico-Cultural), approved by the Spanish Royal Decree, 29 December 1928, and published in the Spanish Official Bulletin on 8 January 1929.